Dining in Branson is not just about enjoying great food, it is also a great time to enjoy the beauty of Branson especially if the restaurant is overlooking the beautiful landscape of the city. The restaurant with great ambiance, relaxing atmosphere, and the ones that provide great view of the surroundings, is a nice place to enjoy a relaxing dining in Branson. In Branson, there are 5 restaurants that provide a nice view of the city which include Dobyn’s Dining Room at The Keeter Center, White River Fish House, Landry’s Seafood House, Black Oak Grill, and Cantina Laredo. 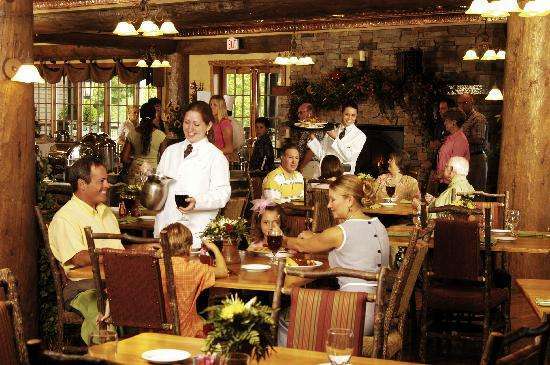 The Dobyn’s Dining Room at the College of the Ozarks is a great place to enjoy fine dining in Branson as it provides great view, great food, and state-of-the-art amenities. While you wait for your table, you can walk around the beautiful campus, enjoy the scenery, and a picturesque view past the chapel. Deep in the Ozarks, the rustic design of Keeter Center and modern furnishings are a perfect blend to complete its well-maintained surroundings. The Dobyn’s Dining Room inside the center boasts itself on serving the finest dining in Branson area. The center has fifteen beautifully-decorated hotel rooms which is just minutes away from many exciting attractions in Branson. The students of the College of the Ozarks help keep and maintain the center’s Dining Room and Meeting Rooms. The well-appointed rooms and suits of Keeter Center are overlooking the campus and feature skyline views. The auditorium at Keeter Center features 320 seats with teleconferencing facilities and conference rooms that can accommodate up to 30 people. The 275-seat Dobyn’s Dining Room is designed with elegance and with private dining area that can accommodate up to 60 guests. Beautifully located at 5 Bass Pro Dr, Branson, MO, the White River Fish House is a floating restaurant on the famous Lake Taneycomo along the Branson Landing promenade. This restaurant is owned by the world-famous outdoor outfitter, Bass Pro Shop. The most exciting aspect of this floating restaurant is the fact that it is a converted barge to become a unique dining establishment that offers great dining in Branson complemented by relaxing atmosphere and panoramic views of the surroundings, beautiful scenery, and wildlife at the foothills of the Ozarks. White River Fish House was named by 417 Magazine as the “Best Restaurant in Branson”. This beautiful floating restaurant in Branson offers not only delicious cuisines, but an incredible relaxing atmosphere and great view of Lake Taneycomo. Menu served in this restaurant is a favourite for everyone which always has a wide list of delicious dishes from pastas to catfish. This scenic restaurant serves local dishes to shoppers and fishermen alike. Whether you arrive by boat or by car, you will certainly enjoy the wide selections of menu served in a place with a relaxing atmosphere. This elegant floating restaurant can accommodate up to three hundred people in one seating in the main dining area. Landry’s Seafood House in Branson is another beautifiul dining place that offers not just delicious seafood but also fantastic atmosphere and nice view of the surroundings. This beautiful restaurant features a huge variety of delicious seafood that include Red Snapper, Shrimp, Catfish, Crawfish, Salmon, Crab, Flounder, and Tuna. This restaurant is not only specializing in seafood dining, they also serve other food like a great grilled steak, if you are not in the mood of eating seafood. Landry’s Seafood House is such a beautiful restaurant where you can enjoy excellent dining in Branson. If you are looking for the best seafood restaurant in Branson, visit none other than Landry’s Seafood House. The eclectic menu of the restaurant encompasses the freshest seasonal fish, seafood, steak, and pasta specialties. This nice dining place also offers an extensive wine list, vegetarian options, a gluten free menu, and kids menu in every location. The true taste of Gulf coast tradition is all about family and exceptional seafood. Landry’s Seafood restaurant strives to bring all of the things together in every location and provide a fun-filled dining experience that will make you think of dining again in this restaurant. Beautifully located at Branson Landing Blvd., Black Oak Grill is a nice restaurant in Branson where you’ll not only enjoy delicious food but also the pristine waters and picturesque views around the lake. The restaurant has a relaxing atmosphere with a friendly service style. Inspired by the black oak trees throughout the Midwest, the Black Oak Grill is sure to satiate your desire of delectable food with distinctive American cuisine. The lodge-inspired interior of the restaurant will let you feel the place as your second home. Black Oak Grill has taken its roots throughout much of America, creating a distinctive, richly flavored, and delicious American cuisine. Black Oak Grill has a distinctive style of running its business in a broad range of neighborhood cafes, urban grills, corner taverns, and boulevard bistros. The bar area of this stylish restaurant in Branson has features of hand crafted cocktails, easy-drinking wines, and premium beers with great American tradition. Black Oak Grill offers something that is ideal for American consumers. Its unique and distinctive style of serving decadent foods create unexpected surprises for all diners. Although Black Oak Grill has just opened its first restaurant in Branson, great foods and impeccable service have already been proven. If you’re ready to enjoy a delicious meal at Black Oak Grill, try the Stone Country Fried Goat Cheese appetizer that comes with pomodoro, fresh basil and bolillo toast points. You will find the sauce fresh and plentiful and the bolillo is a great option for the toast, it’s nice, and crusty with visible garlic. The Idaho Trout Deviled Eggs is so tasty which comes three to a plate, you will surely love the slight horseradish flavor and smokiness of the trout. Beautifully located in Branson Landing Blvd., Cantina Laredo is another restaurant in Branson where you can enjoy not only the authentic taste of Mexican cuisine but also a great view of the lake. When you dine at Cantina Laredo, you will truly be satisfied with the authentic taste of Mexican food. Some of the delicious menus of Cantina Laredo include the Top Shelf Guacamole which is served fresh at your table; Ahi Tuna tacos (mini-crispy tacos with sushi cut ahi tuna, jicama slaw and guacamole, and chipothe aioli); Quesadillas Al Carbon; Nachos Al Carbon with choice of Chicken Fajita or Beef Fajita; and Queso Laredo (queso with taco meat and pico de gallo). This restaurant always serves free chips and salsa. Cantina Laredo is the only place in Branson that serves hot salsas in temperature hot. Some diners find it great to enjoy cold salsa. At Cantina Laredo, you don’t only enjoy their authentic Mexican cuisine, you also enjoy the great view outside the restaurant and the surrounding area near the beautiful lake. In this Mexican restaurant, when the weather is nice, it is great to be seated on the patio and get the chance to watch a spectacular fountain show and great crowd strolling in the promenade of Branson Landing. So, if you want to enjoy the beautiful landscape and other scenic spots while dining in Branson, look for these 5 restaurants as they provide great view of the city.